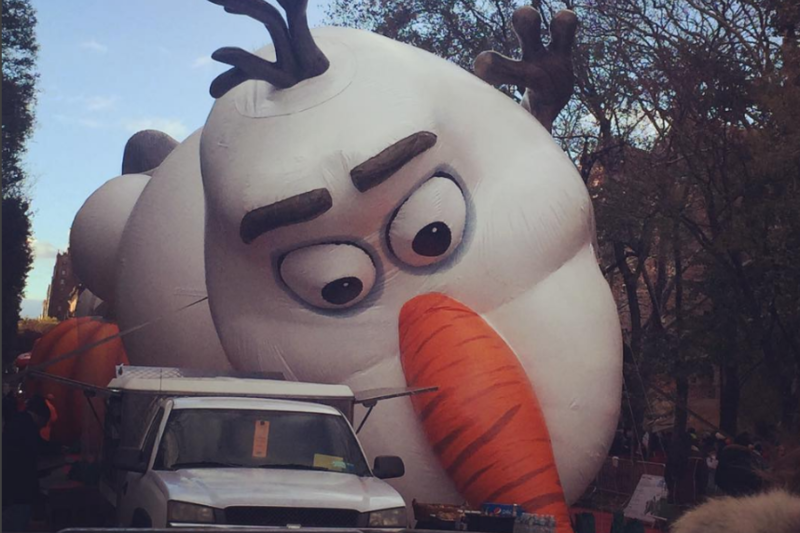 The holiday season just got a lot more exciting with the return of FAO Schwarz. Here we are again looking towards the frost of winter, each day a march towards an earlier and earlier nightfall. Hoorah! I, for one, am looking forward to a little bit of hibernation with my family. After the packed schedules of summer and neverending rhythm of fall activities, I’m excited to slow down a little. The weather won’t be so nice that you “have” to get the kids outside. My family is tired. 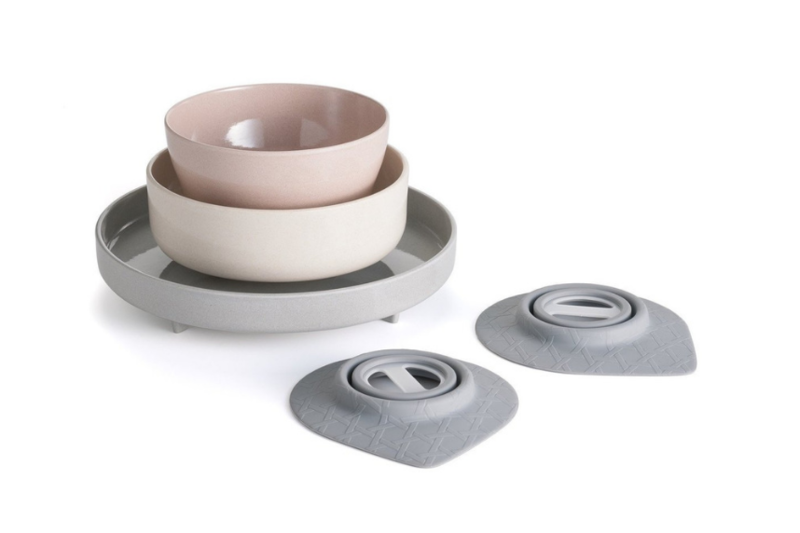 Before the stress of the holidays seeps in, we’re going to recharge. This November is going to be about quality over quantity. Sure, we’re going to go to a museum, see a show, and start our holiday shopping with a bang. But we’re also going to make time for reading books from a book fair, watching movies, baking bread, and giving thanks to all we have to be grateful for. Winter is coming, and we’re ready for it. One of the most exciting things to happen in New York for kids is the re-opening of the legendary store, FAO Schwarz. If you’ve been lamenting the closing of the classic store in 2015 and with it your dreams of your child dancing on the big piano, then you will be happy to hear that the iconic piano is back too! On Friday, November 16th, just in time for holiday shopping, the store will be open for business in its new 20,000-square-foot location in Rockefeller Plaza. Expect product demonstrations, magicians and human toy soldiers. Expect the tourists to descend, so try to get there on the off-hours. FAO Schwarz, 30 Rockefeller Plaza, Manhattan. One way to get kids excited to read is by introducing them to their favorite authors and illustrators. 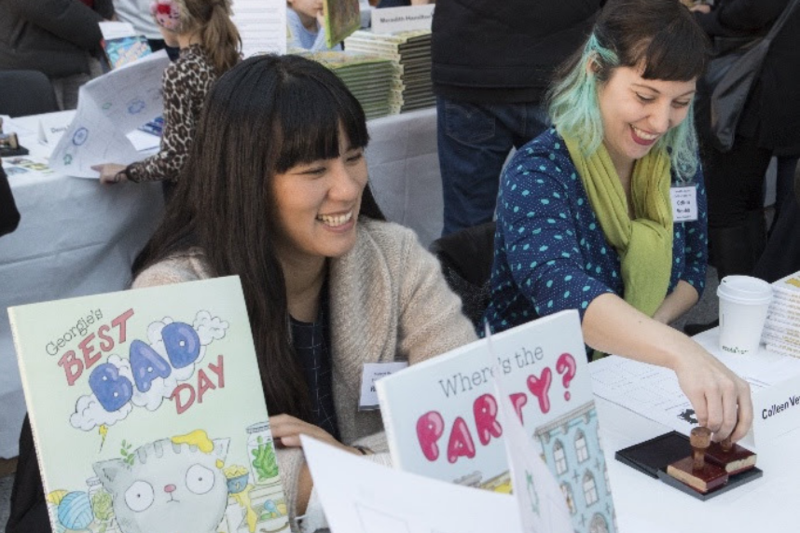 The Brooklyn Children’s Book Fair at the Brooklyn Museum on Saturday, November 17th from 11:30am-4pm is an annual free event featuring readings, illustrator presentations, and art workshops. Featured beloved children’s authors include Abby Hanlon (Dory Fantasmagory series), Selina Alko and Sean Qualls (Can I Touch Your Hair? ), and Peter Brown (The Wild Robot), among others. Stock up on the books for the cold weather ahead, and you’ll have enough reading materials to last the winter. Brooklyn Museum, 200 Eastern Parkway, Prospect Heights. A stuffed bear in green corduroys who loses a button and learns to ride an escalator is an odd choice for an NYC hero. Yet, the series of Curdoroy has captured city kids’ imaginations for decades since its publication in 1968. And now author/illustrator Don Freeman’s illustrations of New York City is the subject of a new exhibition that is not specifically for children, but certainly will be enjoyed by Corduroy’s young fans. 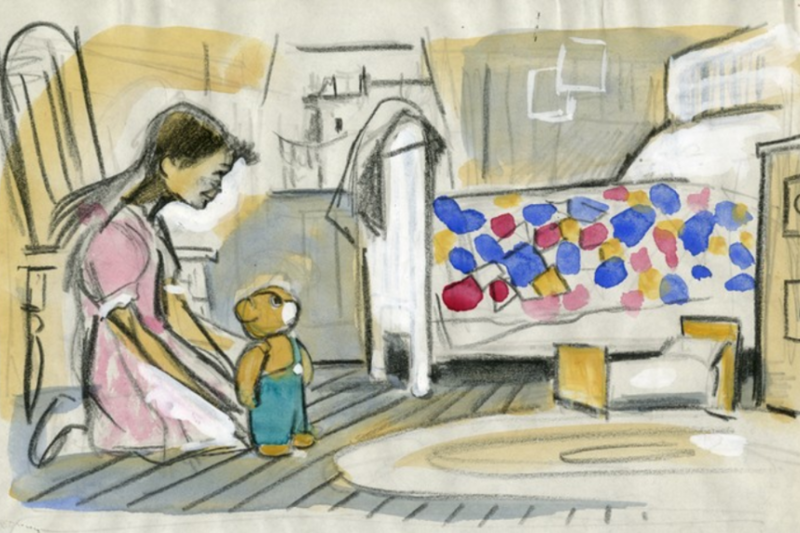 “A City of Corduroy: Don Freeman’s Work,” which opens Wednesday, November 21st, will breathe life into all of his children’s books that took place in New York, not just Corduroy. Pet of the Met and Hattie the Backstage Bat are two books your kids may not yet be familiar with. Expect sketches, paintings, prints, and probably a great gift store selection. Museum of the City of New York, 1220 Fifth Avenue, Manhattan. Open daily: 10am-6pm. Adults: $18, Kids: free. If your oven is constantly on through December baking up a smorgasbord of holiday treats, then you’ll be happy to have your kids join you in the kitchen. 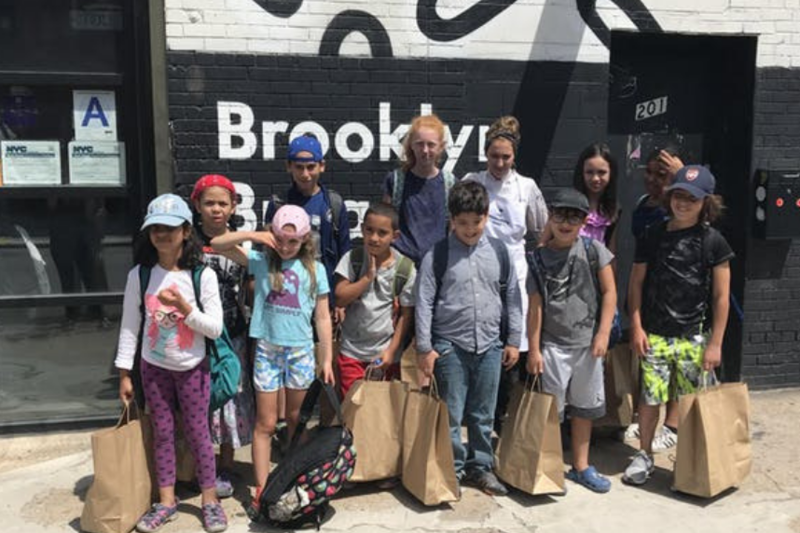 Brooklyn Bread Lab, the warehouse owned by The Williamsburg Hotel is hosting a series of bread baking classes for kids (ages 6 and up) on Saturday, November 24th and Saturday, December 1st. Chef Leah Morrow, executive pastry chef at the Williamsburg Hotel, will lead kids on how sourdough bread is made from start to finish. All kids will get to wear a custom apron and create their own loaf of bread to take home. Brooklyn Based writer Nicole Davis took an adult version of the class, and the forming and shaping of the dough and will feel a lot like an art class. Brooklyn Bread Lab, 201 Moore Street, Williamsburg. ($95; ticket price includes 1 adult and 1 child – the second adult/child is an extra $35). Tickets available here. 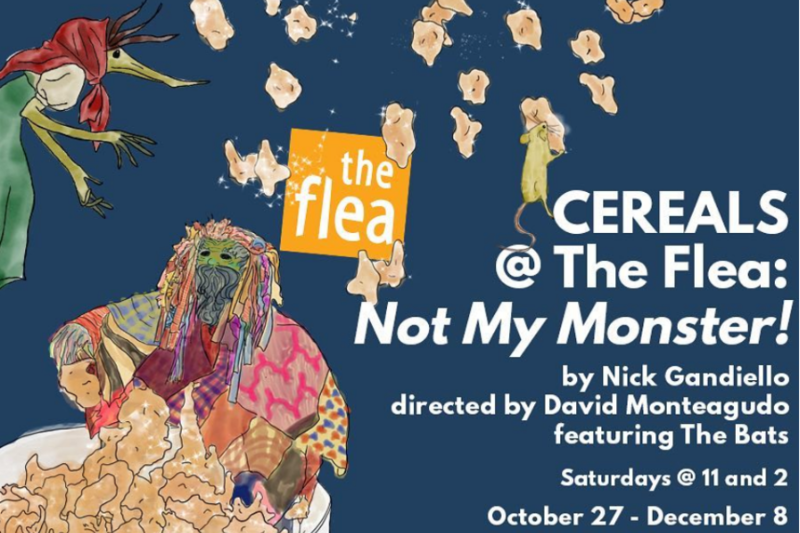 My son’s phenomenal theater teacher at The Stage Theatre School will be starring in an international folktale called, Cereals: Not My Monster! We are so excited to see his high energy and talent on the stage instead of behind the scenes. The show is based on Russian folklore about a house spirit who protects a family in their house, and what happens when one family moves. Performances will take place every Saturday at 11 am and 2 pm through December 8th and are recommended for children 5 and up. Purchase of a ticket includes a box of cereal that kids can snack on during the show. Also, kids can stay afterward and meet and take photos with the cast. Tickets: $15. The Flea Theater, 20 Thomas St., Manhattan. Is your child’s favorite part of opening gifts playing with the wrapping paper and the tape? Then they are definitely the demo for TapeScape!, an explorable structure made out of 480 rolls of packing tape. This is the 16th tapescape ever made, but the first in New York City—if you don’t include that time your child unrolled a package of scotch tape when you weren’t looking. 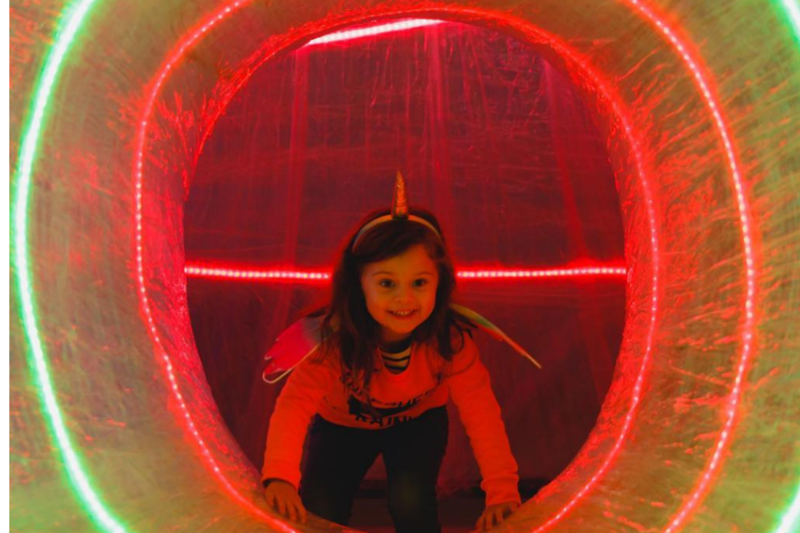 Your kids can explore 15 miles of tape covered tunnels and scaffolding. It’s like an indoor playground complete with pulsating LED lights. From what I hear from someone who has gone, if the museum is busy, kids will have only a short amount of time to play. So this may not be enough to make a special trip to the museum, but more of an added bonus for when you are there. The exhibit runs through December 30th, so you can go again and again. Brooklyn Children’s Museum, 145 Brooklyn Ave., Crown Heights. Exhibit runs through December 30, 2018. Thursday & Friday, 2 pm- 5 pm. Saturday & Sunday, 11 am- 6 pm. $11 per person. 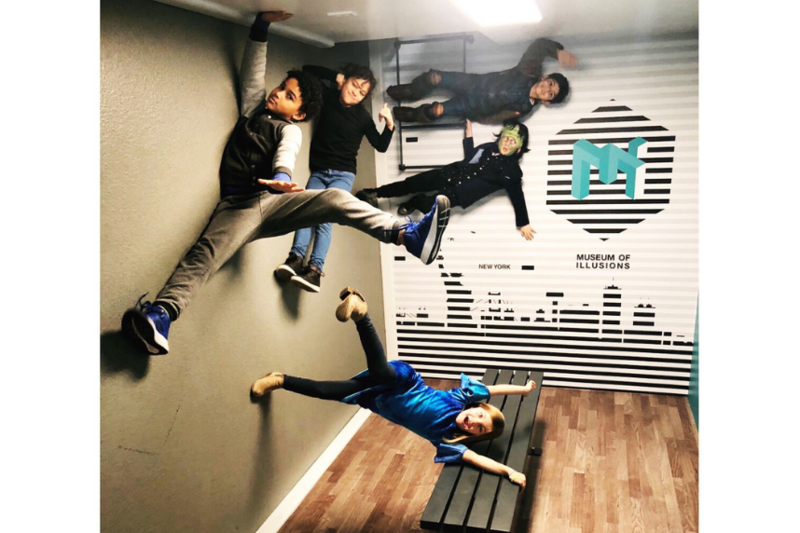 The brand new Museum of Illusions might look at first just like the pop-up immersive experiences that are all over town, but that would be the first illusion. Created in Croatia, this museum signed a 15-year lease in the Meatpacking District, so it will be here for quite some time. Also, there are things for your child to learn, not just backgrounds for Instagram. There are optical illusion pictures, holograms, and interactive exhibits, all of which children are encouraged to touch. My son had his 9th birthday here, and he and his friends had a blast. Upstairs is a game room with wooden puzzles and brain teasers for kids to work with. The infinity room full of mirrors, the anti-gravity room on a slant, and a dance party full of colored shadows will keep your child entertained, bewildered and contentedly confused. It’s probably best for kids 6 and up. Museum of Illusions, 77 Eight Avenue, Manhattan. Adults: $19, Kids (6-13): $15, Family ticket: $53. It’s a great month for parenting films on Netflix. (Is that an actual genre? And if not, it should be.) The Kindergarten Teacher stars the magnificent Maggie Gyllenhaal as a kindergarten teacher/mother/wife who is searching for an artistic life. She projects that urge onto a child in her classroom, whom she believes has great poetic talent. As you may suspect, this goes awry very quickly and uncomfortably. I think as parents seeking greatness from our kids, we can all relate. Meanwhile, Private Life explores another aspect of a woman’s creative livelihood. When an NYC couple in their 40s (played by Kathryn Hahn and Paul Giamatti) are struggling to conceive, they try many different fertility options, struggling with their past life choices which included focusing on career success rather than babymaking in their 30s. It’s an honest look at the hope and heartbreak of today’s questions about conception.